I don’t have the fancy grapefruit spoons with the serrated edges, so when I eat a grapefruit half, I generally run a knife around the outer edge and then just take my chances digging into the fruit with a plain spoon. The end result is a bit smushed up, with lots of juice left in the bottom of the grapefruit rind. Which, with all the brown sugar I typically sprinkle on the surface isn’t a bad thing; grapefruity and sweet goodness. While eating a grapefruit today for breakfast and struggling with the fruit, I thought “Gee, perhaps I should get some of those serrated spoons…” Then I thought, “Nah, I’ll just use the grapefruit in something else. Mmmm, cupcakes…” Yep, I went from healthy (mostly) breakfast food to baked treat in the blink of a eye. My first thought was to take the recipe from The Brown Derby for the grapefruit cake and change it into cupcakes. Sadly, this recipe only has a couple of tablespoons of juice in the whole thing and I don’t think that is enough for a really good grapefruit flavor. I went in search of something better and I think I found it here. This recipe calls for 1/2 cup of juice and pulp, which is basically what I have when I try to eat my grapefruit. I think this will be perfect with a little cream cheese frosting. So really, this was a long way of saying that having the right tool for the right job is important. It keeps people from mangling their grapefruit and from eating cupcakes. Hmmmm, well I’m against the mangling part anyway. I had such a wonderful birthday, which I wisely strung out over two days. Sure, getting older isn’t any fun but the rest of the birthday stuff certainly makes up for it. Friday, I had a lovely bit of fondue with my hubby and a quiet evening watching British comedy. Saturday, my family gathered for some seafood (I had grilled shrimp and scallops – delish!) and then a generous helping of my mother’s wonderful Black Forest cake. Kirsch brandy, sweet cherries, whipped cream, chocolate cake….wow, what a wonderful dessert. As if all this wonderment wasn’t enough, I received gifts that were tailor made. Hubby found a full set of Jane Austen hardcover books for me, which are even now right next to me on my desk. My sister and brother-in-law picked out the exact skirt I had lusted over at a shop called Torrid, so that was an excellent surprise. My grandmother found some wonderful British treats for me – turkish delight, cherry jelly, almond and cherry tea….Mmmmmm. And if that weren’t enough, my mom made a gorgeous drawing of Jane Austen for me, which is already in a place of honor above my sewing table. Yep, it was one swell birthday and it reminded me of just how I lucky I am. Truly, I am so grateful for my wonderful family. Not only do they know me so well (and love me in spite of that), but they have the infinite grace not to mention all the gray hair that another year has brought to me. Can you get luckier than that? I think not. *Brown betty pot photo found here. No, I’m not going for a crossword championship. I’m introducing you to my two new adopted words. I am the proud mother to “squiriferous” and his sister “senticous”. Squiriferous is quite the little gentleman; he insists on wearing a cravat and dining at his club when he isn’t holding doors open for women and laying his cape down over mudpuddles. His sister, Senticous, is a thorny girl – you might even call her prickly, but that is just her way. If you adopt a darling or two for your very own, please let me know. Maybe we can set up a playdate with the kids…with squiriferous anyway. Banana bread is one of those things I really love but I don’t always think about making. Usually, we eat bananas up too quickly to have any lingering around that are getting mushy. I’m one of those people that likes my banana without any brown on the skin, in fact a banana that has just turned yellow is my most favorite. Sure, these kind of bananas are a little more “spiky” as NR would say, but that’s what I like – no mushy banana flavor for me. But as it happened, I had four small bananas that were really getting spotty. Once the spots starts it is all over for me, so making banana bread became the plan. The question was though what recipe to use. I like my banana bread full of walnuts; hubby and NR want theirs without nuts. I like my banana bread to have a brown sugar flavor, with allspice and vanilla in the mix too. There are so many banana bread recipes out there, it is hard to know what recipe to go to – my previous adventures in banana bread have yielded “ok but not exciting” results. I’m not sure what I’m looking for from the banana bread but at least for Hubby, his benchmark is the banana bread his grandma used to make. I’ve never had her bread and I don’t have her recipe, so duplicating her bread wasn’t the plan. Happily, the recipe I chose apparently was very close to her bread, just by accident. It’s nice when those things happen. I took the recipe from my copy of the “Yellow Farmhouse Cookbook” by Christopher Kimball (editor of Cook’s Country) and I made a couple of tiny tweaks. I added allspice, just a tiny pinch, and I used all four of my bananas which probably put the amount of banana beyond the 1 1/2 cups called for in the recipe. I also added a wee bit more salt. The bread had a great banana flavor and a nice texture. It didn’t have bells and whistles, no brown sugar or nuts, but it was pretty good with a bit of butter. I might just have to buy an extra bunch of bananas to ensure we have more banana bread in the future. Heat the over to 350 degrees. Grease a standard loaf pan with vegetable oil spray. Whisk flour, baking soda, allspice, and salt. In a separate bowl, beat the butter, sugar and eggs for 2 minutes in a stand mixer on medium. Mix in the vanilla and mashed banana, mix for 30 seconds. Mix in the flour mixture until just combined. Do not overmix. Scoop mixture into prepared pan and bake for 50 – 60 minutes (until cake tester comes out clean – it was 50 minutes for me). Let cook in the pan on a rack for 10 minutes. Invert the pan on to the rack and let the bread cool completely. I’m trapped home today, all thanks to the cable guy/gal. It’s a long story, best saved for some snowy night in front of the fire, but suffice to say that our long-awaited high speed internet will be installed today – between noon and four o’clock. Or so I believe. Which means I’m stuck home today. I could have gotten up early and done the few errands I have hanging on me but morning are generally reserved for “school time” for NR and heck, I just didn’t have the oomph in me today anyway. So we’re putting off the pharmacy and the library until tomorrow. The good news about being at home with no plans to leave is that I can finally try out a time-intensive recipe that I’ve been wanting to eat – French style pot roast. Considering this very old dish used to take up to three days to make, I won’t balk at the four hours or so it is going to take today. Most of the that time is hands-off time – roasting in the oven – so I can get some crochet done while I watch “Amelie” (and finally know why so many people love this French film). Wow, you’d think I planned all this Gallic fun in advance but it is just a coincidence. Quel Surprise! The red wine is reducing on the stove and the garlic cloves are all pressed. I can tell you that the house smells delicious and if I only had a fresh baguette to munch on, I’d be a happy camper (or whatever that translates to in French) right now. But I’ll get by with my ham sandwich until dinnertime. This may sound like a continuation of the last post but it is a bit different. I enjoy browsing eBay now and then for old patterns or something that catches my eye. 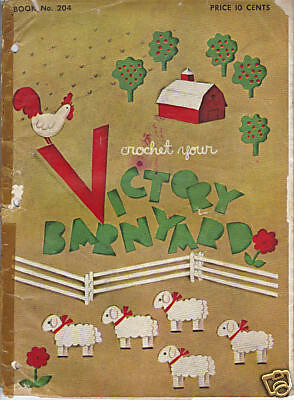 While browsing the other day, I found an old pattern book from 1943 called “Crochet your Victory Barnyard”. Cute, huh? Long time readers already know I have a soft spot in my head for the homefront war effort of “Knit Your Bit”, but this little booklet got me thinking. What other V for Victory type of projects were afoot during WWII? The Victory Garden idea is well known; growing produce in front yards, vacant lots, even plots in Hyde Park so that the commercial produce could go to the troops. There are plenty of references around for the gardens, as well as scrap metal drives and collecting pennies. But the idea that there were crafting projects aimed at bolstering morale and the Victory effort caught my eye. I started looking around for more of these types of crafts and so far I haven’t found that many. I did find a cute embroidery series of “Victory Cats” that has a different cat and a different reminder for each day of the week. “Be suspicious”, “Ride a Bike”, “Keep ’em flying”, etc. I found a “Victory Sweater” in the Victoria and Albert Museum archives that is essentially just a red/white/blue concoction but that isn’t exactly the same thing. Fostering patriotism is certainly common in crafting – today there are tons of Old Glory patterns in every craft – but the homefront war effort was unique, with rationing and price ceilings. Ok, so what does any of this have to do with now? 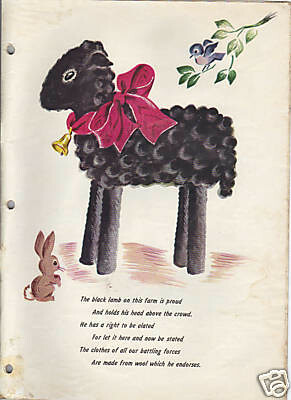 Well, while searching I found another booklet called “Make Do and Mend for Victory”. This booklet’s job was to teach would-be seamstresses how to take their old clothes, and the clothes of their husbands off fighting, and turn them into newer looking items. There are instructions for converting men’s shirts into girls’ dresses, revamping older dresses by changing the collar or the hem, etc. What’s interesting about this is that I recently purchased a new book called “Complete Embellishing: Techniques and Projects” by Kayte Terry. Ms. Terry’s book has tons of ways to refab an old boring item into something you really like. Adding interest to a neckline, changing the hemline of a skirt (sound familiar?) and reusing materials. The idea behind making do with what you have and mending it (or revamping it) is certainly relevant today. Sure, we aren’t sending our nation’s wool into the construction of military uniforms anymore, but hard times for many people are here and learning to make lemonade out of a wallet full of lemons is no bad thing. For those of you who sew (or make other crafts) you probably have done this before to some degree. But for those of us new to the sewing game, this might be a challenge and one worth taking on. I’m not suggesting making dresses out of flour sacks, like something out of the Grapes of Wrath (though little girl dresses out of pillowcases can be really really cute) but maybe not being so quick to donate clothes that have seen better days. Maybe those shirts, those jeans can get a new lease on life as something else. Call it what you want – Making Do, Upcycling – but I call it smart.